Marketing/Selling of products you will be managing on your own; while company will provide you promotional material for marketing support as given in offer letter. All the marketing & distribution is done by you. Company will not be providing medical representative or any kind of training. As per company norms you don’t need to deposit any amount to take franchise but there is minimum amount of 30000/- required to start your business, for this 30000/- you will get products & other promotional materials. Even there is no compulsion to open up a shop or take a specific area from company’s side. That is totally depend on your choice. From company’s side you will get long expiry products (i.e, after twelve months expiry or even more) but company will not accept any products that is sold out unless there is any quality related issues. Also, company will not provide any claim on damage that occurs in transit; concerned transporter will be responsible for the same. GST rate will charge on the bases of Product category i.e Pharmaceuticals, Food or Nutraceuticals, Soap/shampoo/cosmetics. (5%, 12% or 18%). 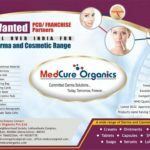 Doctors, Chemists, Medical Representative, Medicine Wholesalers, Retailers, or any individual who has experience in pharma industry of more than 5 years. Immense growth that depend on you how well you take your business. Most of the queries we have covered but if there is any other query that you want to ask, feel free to reach us at 9193942564 / 9557871478 / 7060522564.